We've known about aloe vera juice benefits for centuries because it has a number of valuable qualities. But, there are some that you might not know. This juice is a potent natural medicinal, and it can help to prevent or improve a wide array of different heath conditions. Aloe vera might just be the most amazing medicinal plant on the planet (well, okay, in my opinion :). For example, if you’re having digestive issues – anything from irritable bowel syndrome to constipation to a simple sour stomach – try some fresh aloe vera juice. Drinking the juice on a regular basis also helps to heal gastrointestinal ulcers and alleviate chronic conditions like Crohn’s disease and celiac disease. If you’re diabetic, you’ll be happy to hear that aloe vera juice has been shown to lower and stabilize fasting blood glucose levels in people with type 2 diabetes. And, many diabetics suffer from peripheral neuropathy. Aloe vera juice helps with that too, because it boosts blood circulation to the arms, hands, feet and legs. Aloe vera also helps prevent and treat candida (yeast) infections, another health condition that many diabetics experience. Topically applied aloe vera’s properties as an analgesic and anti-inflammatory are widely known. Topical use can help heal burns and other skin wounds, but it can also help reduce the pain and inflammation that are so typical with arthritis. Aloe vera also works for this purpose internally - the juice reduces inflammation too. Combined with the proper diet, the anti-inflammatory properties of aloe vera juice can help alleviate joint and muscle pain. Topically applied aloe vera is also great for your skin. It nourishes and hydrates the skin and helps heal cuts, scrapes and burns by accelerating the production of new skin cells. The juice promotes healthy skin too, acting in much the same way. Both forms of aloe have natural antibacterial, antiviral and antifungal properties. Many of us have high blood cholesterol and/or triglyceride levels. Aloe vera juice benefits help to lower both in a natural way, without taking expensive and potentially harmful statin drugs. Whether it’s caused by a poor diet, smoking or a health condition, some people’s blood carries less-than-optimal amounts of oxygen. Aloe vera juice can boost your blood’s oxygen-carrying capacity. Oxygen-rich blood has several benefits, including improved cardiovascular health, improved tissue and organ function, increased physical stamina, improved athletic performance, and faster recovery from strenuous exercise. It can also reduce the likelihood of stroke and heart attack. Simply put, the beneficial effects of Vitamin C, Vitamin E and other antioxidant vitamins are amplified by aloe vera juice. This potentiating effect might be linked with aloe’s ability to enhance your blood’s capacity to transport oxygen and nutrients to your body’s tissues. Many believe that aloe vera boosts immune system function. That means that in addition to helping your body fend off the common cold, influenza and various other infections, it might have anti-cancer properties. Studies indicate it may be able to shrink cancerous tumors and extend the lifespan of cancer patients. As amazing as aloe vera juice benefits are, it offers even more. It’s no wonder that it’s becoming more and more popular. 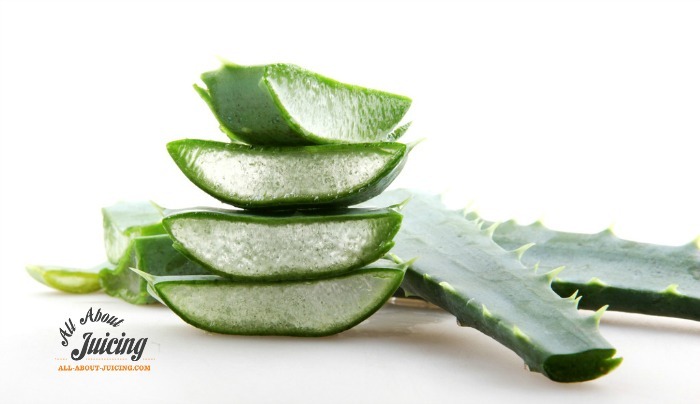 Interestingly, the ancient Egyptians were using aloe vera medicinally more than 5,000 years ago. It’s taken us all this time to discover the additional benefits of this extraordinary plant. Personally, I always have a fresh organic ready-to-go bottle in my fridge or a plant growing outside. I use it mostly for upset stomach or if someone gets heartburn. It works like magic. It's better blended than juiced, so that's what I recommend. I'll take you through the steps of getting this healthy gel out of the leaf and into your body. It's super easy. Click here for a how to.